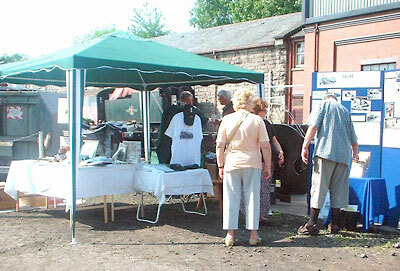 The trust held it's annual draw on Sunday 23rd May at the Members & Shareholders weekend. It was a blisteringly hot weekend made bearable only because of our new gazebo which kept the sales stand and team under cover. Toward the end of the day a young man, John Taylor from Telford, who was very excited by the 82045 project was asked to draw our winners. The winners are:- John (Jack) Snead, Anthony Brown, Mathew Strong, R Whitehead, Sam Turbett, Alan Garbett, Mrs K Arnold, Mike Parker, Bob Lawson, Stephen Pearse, A Morriss, R Panes, Jim Bodfish and Harry (Dave Wilson). We should have some photographs of Jack on the footplate in our next update. Thank you to all who supported the raffle which looks like becoming a very popular event, and to all our helpers who sold, sold, sold, right up to the last minute. 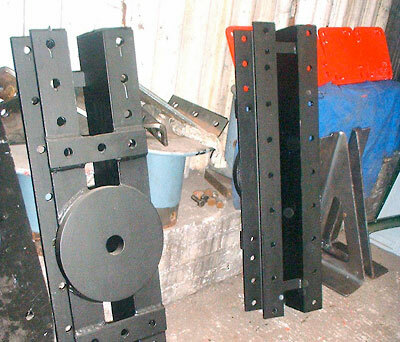 We are currently awaiting the firebox support bracket casting from the foundry, but we have received two castings for two brackets for flexible frame stays which now need machining and drilling at Bridgnorth. in Sheffield fabrication is under way of the two stretchers which fit just inside the buffer beams and which hold up the pony truck pivot centres. We are close to placing the order for horn blocks and horn guides. 82045 member and former Nine Elms fireman, Dave Wilson, has written a splendid article about his memories and experiences with the 82XXX`s and our publicity officer Chris Proudfoot has picked up the story with details of the 82045 project. The article appeared in the May issue of Heritage Railway and is entitled "Tank Gang". There is also a full page advert for 82045 on the inside back page together with an appeal for members and donations. This article marks the beginning of a publicity drive in 2010. We have some rather large wheels to buy! 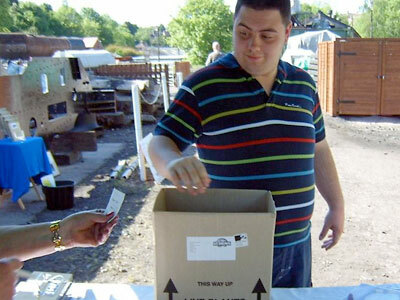 John Taylor from Telford, draws the winning ticket. Under the shade of the Coolabah Tree! 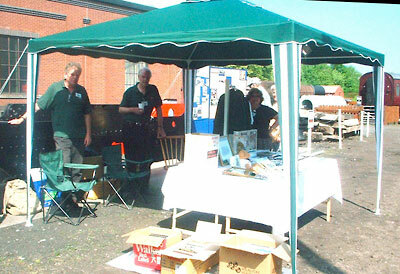 Chris, Tony and Barbara keep in the shade at the SVR's Members & Shareholders weekend.